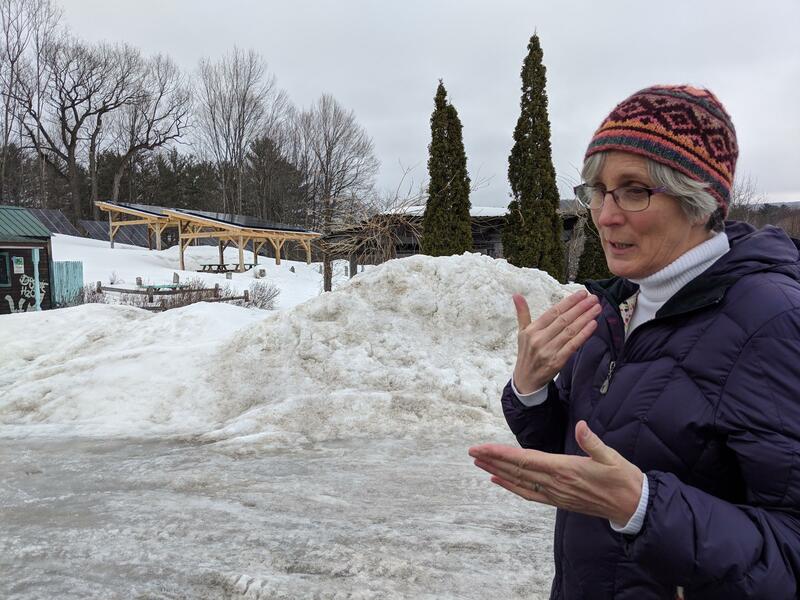 Sandra Jones of New Hampshire Solar Shares shows off their first low-income solar array, behind Frosty Scoops in Plymouth. A new kind of solar array has begun to pop up in New Hampshire in the past few years. It's known as a low-income solar project: Grants and donations pay the up-front installation cost, and the savings the array generates go straight to low-income residents. It's the kind of solar project Gov. Chris Sununu has been saying he wants to see more of. But advocates -- and low-income ratepayers themselves -- say the governor isn't doing enough to make that happen. Behind the Frosty Scoops ice cream stand in Plymouth sits a handful of picnic tables shaded by wooden awnings topped with solar panels. More rows of solar panels stand nearby. Sandra Jones, of the nonprofit New Hampshire Solar Shares, says this is what low-income solar in this state looks like. “One of the reasons we built it in the way we did was to have a place where people can picnic and eat their ice cream and learn about solar all at the same time,” she says. The array benefits 10 low-income families in the area – people who already qualify for fuel assistance. The New Hampshire Electric Co-op buys the solar array’s electricity, and gives the participating families each $25 dollars a month off their electric bills. There are only a few arrays like this in the state. One powers a resident-owned mobile home park in Lebanon. Another sits atop a senior housing complex in Gilford. And Jones says her group plans to build two more arrays like the one at this picnic area in the next few years, in Warren and the Squam Lakes region. Officials celebrated a new low-income solar array at a resident-owned mobile home community in Lebanon last November. “I want those projects to be focused on not these giant mega-arrays that put money in the back pockets of these big, wealthy developers,” he said. “I want that money to be returned directly to low-income families, low-income neighborhoods, the elderly, fixed incomes – that’s where those solar projects should go. “And that's going to be my focus – making sure those that otherwise would be paying the most, and be bearing the brunt of that cost, actually get the benefits from those types of programs,” Sununu said. But Jones says since then, she hasn’t seen much support to go along with those words. The Renewable Energy Fund is a pool of money set aside to fund rebates and energy projects. The money comes from payments by electric companies that don't meet renewable energy standards. Jones says a grant from that fund covered 70 percent of the cost of the picnic array, and helped get it built. It’s the most direct way the state already encourages the kind of project Sununu has said he wants to see. But Sununu’s proposed budget for the next two years would take at least half the Renewable Energy Fund – $2.5 million – to pay for lead paint remediation. Jones says, if Sununu believes in low-income solar, that funding should come from somewhere else. "We can't ignore the fact that we are in a climate crisis right now,” she says. “Every idea that is going to increase the amount of clean energy on the grid and prepare us to look at new technology and experiment with new technology needs to be looked at. So I would urge the governor to keep his mind open." 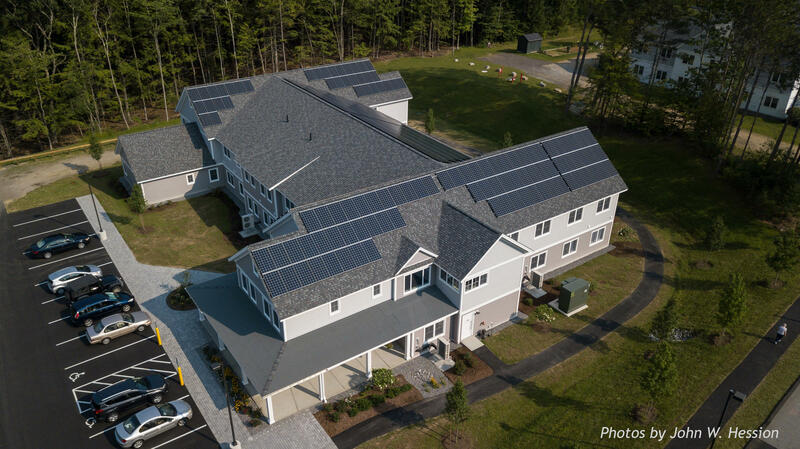 Solar panels top a new high-efficiency senior housing complex in the Lakes Region. There are other ways the governor could help shield low-income residents from the state's increasingly high electric rates. For example, Democrats in the legislature are advancing plans to fund more energy efficiency programs that benefit low-income ratepayers, and require utilities to build more low-income solar arrays. Such programs have successfully encouraged more community solar arrays in other states. But conservative voices in Concord maintain that proposals like these will raise rates for other consumers, especially big businesses. And Sununu hasn't been shy about suggesting he might veto all kinds of Democratic proposals – including some related to renewable energy. One pro-solar bill that's been particularly controversial would expand net energy metering – where customers generate power and sell it back to the grid for a credit off their energy bill. The change would benefit big customers, like towns and businesses, and it would not directly affect residential users, since the rates they pay are separate. The theory of how this net metering may pass costs onto other ratepayers is simple – utilities sell less power when customers generate more on their own, potentially leading to higher rates – but the details of those costs are hard to pin down. Advocates for the bill, like Concord City Councilor Rob Werner, say letting towns net meter more solar power will actually help them pass on benefits indirectly to low-income residents, through reduced property taxes and other opportunities to use renewable energy. “I think it creates economic opportunity, it creates jobs… and it helps communities control their energy costs,” Werner says. But Sununu and groups like the New England Ratepayers Association still argue the bill would pass costs onto vulnerable customers. Sununu vetoed the bill last year, and though it has even more bipartisan support this year, he’s hinted he may do so again. Some Granite Staters would prefer to see Sununu championing this issue he's talked so much about this year. 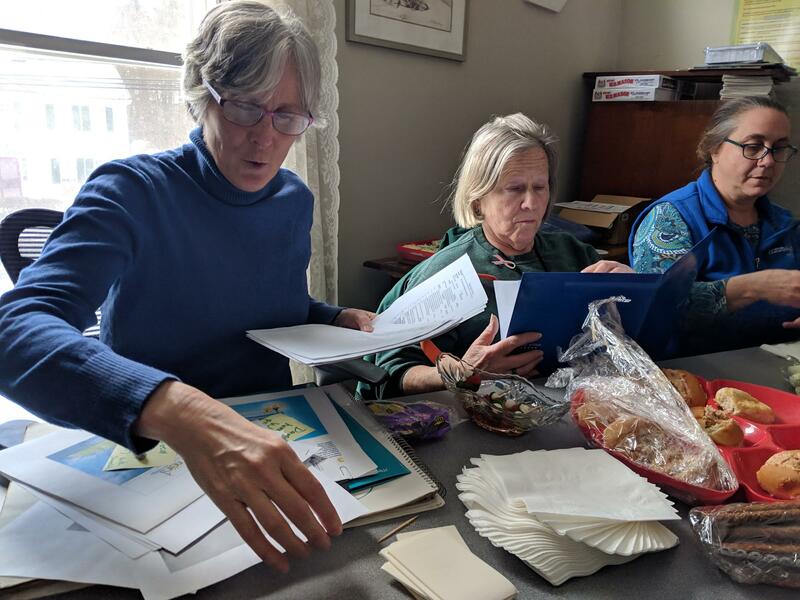 A recent snowy Saturday in Plymouth found the shareholders of that picnic solar array gathered for a regular meeting in Sandra Jones' office. They shared plates of snacks, ideas for summer educational activities at the picnic area, and lots of energy saving tips. Sandra Jones and other members of N.H. Solar Shares trade energy efficiency tips over snacks at a recent meeting in Plymouth. The Plymouth project is a little different than some community solar arrays. Participants only get the solar credit on their bills for two years – then they pass it on to a friend or neighbor. But along the way, they also get a lot of education about energy efficiency and ways to save long-term. Retired teacher Joan Thomas – who calls herself a Yankee through and through – is one participant in this first cycle of the program. "Here's my bill that really shocked me,” she says, showing me her latest statement from the New Hampshire Electric Co-op. Thomas is a widow, living with multiple sclerosis on a fixed income of social security and disability benefits. She lives in a large, nearly 40-year-old mobile home. Since joining Solar Shares, she's gone all-out on energy efficiency – replacing light bulbs, insulating everything, beginning to shower and do laundry at off-peak hours. Add that to her monthly solar credits, and the New Hampshire Electric Co-op is actually paying her this month. These energy efficiency changes will stick with Thomas long after she exits the solar program. But she says she'd love to put solar panels on her own roof someday – if there was ever, say, a state aid program that made it affordable. New Hampshire’s timber industry scored a major victory today as legislators narrowly voted to overturn Gov. Chris Sununu’s veto of a bill subsidizing biomass plants. But lawmakers fell just short of overturning another energy veto that had become intertwined with the biomass bill – one subsidizing net metering. New Hampshire’s largest solar company wants to train more electricians to fill jobs in renewable energy and other industries. ReVision Energy is touting its new training center now, as part of National Apprenticeship Week. But the program already has 50 students enrolled. For the next four years, those apprentices will earn full-time wages – up to $25 an hour – and log enough training hours to get their state electrician certification. The company will also train electricians in Maine and, starting next year, Massachusetts.